Somaliland is finalising a huge port investment, boosting its efforts to serve as a trade hub between the African and Arab worlds. Somaliland is finalising a multi-million dollar deal with a leading international operator to develop a port at Berbera, on the Gulf of Aden, bolstering the breakaway nation's bid to position itself as a export gateway for landlocked Ethiopia, according to an envoy working on the deal. "After six months of negotiations, an agreement has been put on the table, which is highly exciting, from one of the world's best port operators," says Jason McCue, a human rights lawyer who serves as an envoy for the state's bid for independence, and who is assembling investors to grow the coastal town of Berbera into a $2.5bn logistics hub. "The moment is there for Somaliland." Mr McCue declined to comment on the size of the port investment, but says it would constitute the single biggest inflow of foreign direct investment in Somaliland's 22 year history of de facto autonomy. "We are talking hundreds of millions," he tells This is Africa. "That port will become a major international port." Authorities in the desert state are trying to overhaul crumbling infrastructure as they seek to capitalise on their position as a bridge between Africa and the Middle East. Ethiopia is Africa's second most populous nation, with 91 million inhabitants, and has annual exports worth almost $1bn, led by coffee and gold. "We are trying to see how we could get international partners to help us with infrastructure. We want to develop the corridor between Berbera and Ethiopia because that is really the lifeline," says Somaliland's foreign minister Mohamed Bihi Yonis. "We are all aiming at Ethiopia and we believe that we could provide support to a third of the population of Ethiopia." This kind of large-scale investment may bolster Somaliland's attempts to gain international recognition. 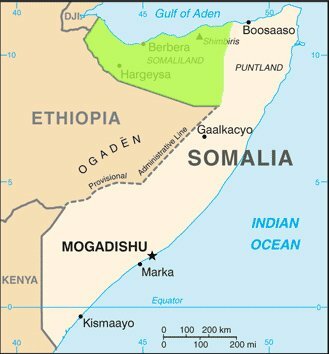 The state unilaterally declared independence when civil war erupted in Somalia in 1991 and is officially seen as an autonomous region rather than a country. But it has held a series of democratic elections, has its own currency, and is a haven of relative refuge from the terrorism and piracy that afflict Mogadishu's government. As well as targeting infrastructure investors, the government has ushered in frontier oil companies like Genel Energy, which are exploring Somaliland's potentially huge reserves. But like Somalia, the nation is hampered by the fact that it has no access to international financial services. "There is almost an inevitability occurring [around the independence bid], as Somaliland creates this financial self-sufficiency," Mr McCue argues. "When big international companies come in, who have immense power in the states where they are from, they are going to demand that their home state pushes for [Somaliland's] independence, because they are going to want to operate in a normal financial services market." Hargeisa's foreign minister says that "dealing with the rest of the world in terms of investments and development and security" is proof that the region is fulfilling the criteria required of a country. "We believe that we will get recognition soon, because we have done well," he claims. But sources close to talks between Somalia and Somaliland tell This is Africa that a new government in Mogadishu shows little indication of changing its stance by recognising the breakaway region's right to independence. Somalia has contested oil licenses awarded by Somaliland's Hargeisa-based government, saying they infringe on old concessions awarded by the federal government before 1991. A draft petroleum bill says the central government alone has the "privilege to distribute natural resources". Somaliland could wait a while longer before it gets the recognition it has been hankering after for two decades.